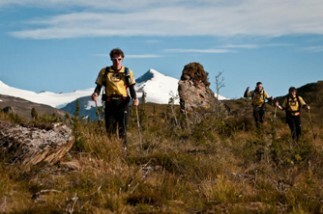 The Adidas Terrex Prunesco team continues to lead the Wenger Patagonian Expedition Race in its sixth day of competition, on its journey through the barren landscapes of southern Chile. According to recent satellite reports, the difference between the leaders would not exceed two hours, keeping the hat-trick championship that Londoners are seeking to obtain in expectation. In addition, the Adidas team, having fewer hours of rest in the body than the Americans, supposes a major disadvantage in the final stages, where GearJunkie.com steadily continues to chase the leader. The competition is scheduled to end with the second leg of mountain bike on next Thursday, but due to the harsh this ninth version of the world’s most extreme test has been, by demanding geographical conditions of the route and bad weather during some days, it is expected that the remaining teams which continue in the race to arrive on Friday, which so far are 7, half of those which began in Las Torres del Paine in Chile on Tuesday, where 3 Chilean teams also started, but were dropping out early.